WILKES-BARRE TOWNSHIP, Penn. 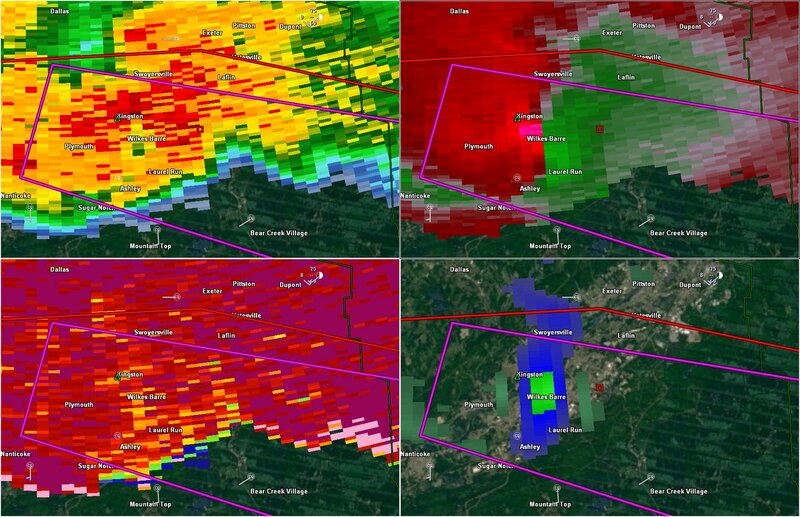 – A tornado warning went into effect around 2100 hours EDT until 2300 on Wednesday, June 13, 2018. 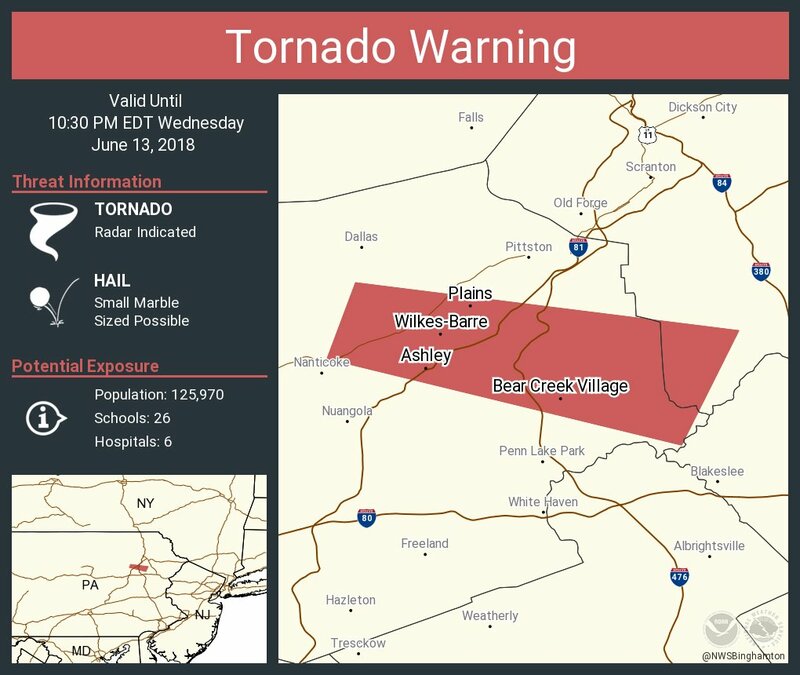 An expected tornado hit a shopping district (one of the largest in NE PA or NEPA) near the Mohegan Sun Arena causing building structural collapses, significant damage, overturned vehicles and entrapment in building and vehicles. A regional amount of resources descended upon the area and worked through the night and early morning hours to search for survivors. There is no word on the count of injuries or if there are any deaths reported. All regional units were released from this incident at 0049 EDT on Wednesday. Local units are still on-scene. There are many eyewitness damage assessments being reported across Social Media and verifiable/reliable sources. Fire crews are doing a deep SAR search for possible entrapped victims. A search by M9Alpha is in effect. Some say it is rare due to being at nighttime and usually at night, the instability is low causing storms to weaken. Saying between EF3-EF4. This is located southwest of Scranton and situated in Luzerne County, PA. It has approximately a population of 40,569 residents. It has industrial roots that is located along the Susquehanna River. The City is approximately two hours away from NYC and Philadelphia. It is about 2.9 square land miles. It is crossed from the northeast to the southwest by I-81, PA RT 309 and Business RT 309 (Wilkes-Barre Township Blvd). Recognizable roadways are Kidder Street, Mundy Street, Highland Park Boulevard, Coal Street, Northampton Street and Blackman Street. The downtown business district is host to about 11,000 employees, the 4th largest downtown workforce in Pennsylvania. Some of the major shopping districts are the Mohegan Sn Area at Casey Plaza (formerly Wachovia Arena), Arena Hub Plaza, Wilkes-Barre Township Commons, Highland Park Boulevard Plaza and the Wyoming Valley Mall (rebuilt after Hurricane Agnes destroyed it in the 1970’s). The Wilkes-Barre City Fire Department consists of 3 Fire/EMS Stations (HQ, South Station and Hollenback Station) located on Ross Street, High Street and Washington Street. This is a paid career Fire Agency. The Wilkes-Barre Township Police Department is made up of both Patrol and Detective Divisions. There are 40 Police Officers and 1 Civilian personnel. The Agency has its own K-9 unit, Directed Enforcement Unit, Narcotics & Gang Unit and a Traffic and Parking Enforcement unit. Their substations are located at the Wyoming Valley Mall, the largest shopping facility in Northeastern part of the State and at Wegman’s Food Market on HIghland Park Boulevard.